The National Bureau of Economic Research (NBER) announced yesterday that the recession is over, and officially ended in June 2009. The NBER gets to make the official “call” on when a recession starts and finishes. Unfortunately, that call is based exclusively on the growth or decline of output of goods and services. In other words, even though this economy continues to lose jobs, and non-farm payrolls are down 329,000 since the official end in June 2009, jobs are irrelevant to the decision. The chart below was in the NY Times on Sept 20, 2010. 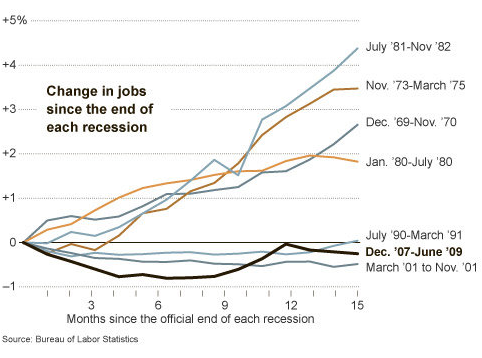 It says that the US economy has lost more jobs that it has added since the recovery began in June 2009. This is total nonsense: the aftermath of the Great Recession (the first output dip was the sharpest decline in employment and economic output since WW II) has left our economy in a very feeble and very heavily indebted state. Therefore, if we do get a second recession in the next year, it won’t really be a double dip, but rather an extension of the first dip, the dip that we have never exited from. Anyone can choose their political jacket and argue whether Obama’s policies may have exacerbated the recession that we are currently in. However, we just don’t believe that the President or the Democratic Congress is responsible for the Great Recession itself. The NBER just took another step towards irrelevancy. We’ve been following the wireless data, handset, and carrier market for many years. Research In Motion reported quarterly results last Thursday evening, and announced that they have shipped 12.1 million Blackberry devices into their channel, but added 4.5 million new subscribers. In other words, a lot of units filled the channel, but about one-third sold through the channel. Moreover, the Company will stop providing guidance on net subscriber additions in a quarter. (That is very bad). The stock was up about 4% in after-hours trading, but ended the day up only 0.5%. Despite the rising tide lifting all smart phone boats, those numbers aren’t that great. It’s the software that makes the hardware sing. That means applications. RIM doesn’t have anywhere near the same number of applications for Blackberrys as are available for the other two main platforms. Frankly, we don’t understand why so many people are missing the point about the current battle between Research in Motion, Apple, Google, and Nokia. (By the way, Nokia and its new ex-Microsoft executive are toast in the USA, but that’s a subject for another blog post). It’s not about the hardware, and it’s not about all the hardware based functionality such a sliding keyboard, or a front facing camera, or a semi-functional antenna. It’s not about a touch screen or a soft keyboard. Those are all beautiful designs. Any average pianist can play the notes on a piano and sound good. A great pianist plays the “music”. In other words, it’s the software that creates the VALUE of the hardware. A recent survey by Motorola (remember them?) indicated that 64% of all GenY mobile users used their mobile device for shopping activities in the last two weeks. Was it the hardware that enabled that shopping or was it the software? According to Motorola, there are 4 billion mobile phones vs. 2 billion credit cards, vs. 1 billion computers, vs. 1 billion landlines. There are 4 births per second. Approximately 39 mobile phones are sold…..per second. These enormous numbers are enabled by unique, innovative, and productivity enhancing software. The reason Apple’s iPhone and various handsets using Google’s AndroidOS are as popular as they are is directly the result of the productivity enhancing applications available for those hardware platforms. Both Apple and Google opened up their respective operating systems to the wild creativity of independent third party software developers. Ironically, iPhone’s market share numbers are falling behind Google’s market share directly as a result of the fact developer’s access to Google’s AndroidOS is “more open” than that of the iPhone. In fact, Steve Jobs is making the same mistake today that he made 20 years ago with his personal computer OS that led to the near death experience at Apple. It is closed, relative to the openness of AndroidOS. Nokia introduced an application marketplace in……2001. Research In Motion announced that it would be licensing its BlackberryOS to any hardware vendor in……2002. Yet, both of these very early efforts died on the vine. Nokia didn’t provide a developer’s kit toolset, and RIM thought that they could charge a fee to hardware vendors because Microsoft was charging a fee for its mobile Windows operating systems. Does anyone remember Verizon’s “open access” announcement in late 2007 that it would allow any CDMA device to access its network and allow those devices to download any application from the network by mid 2008? Google’s Android was the major beneficiary of that announcement. What can an entrepreneur learn from these lessons? As Mike Maples Jr. suggests: Be Different, Not Better. Google offered its AndroidOS to any hardware vendor, for the astronomical price of …..Free. Google had determined a different method to monetize their development cost. Apple offered its rabidly loyal developers a development tool kit, and provided a marketplace for those applications which piggy-backed off the wildly successful music marketplace used by their iPod product line. Both were different from what was the accepted method of sales and distribution. Both looked at the existing market, figured out the rules of that market, and then figured out how to get around the rules. We’re sure that Nokia and RIM will become a great Harvard case study on how massive scale and market share prevents innovation. They were dominant globally. Why would they change? It was left to the companies that had no market share, and nothing to protect to change the rules and be different. If you want to call yourself a Super Angel, then the entry fee will be $20K per investment, and you will need to do at least one investment per month – or one per week, if you can handle it. You get to be the ultimate opportunist and invest in anything you like. Move over traditional angels and traditional VCs. Here is why this is a good deal. We attended Capital Factory’s Demo Day 2010. It was a great day, with some interesting new companies and some very interesting speakers. The organizers and mentors can be proud of their work. Dave McClure, of Twitter and 500 Startups fame, made an entertaining and “F-bomb filled” presentation. It was also insightful. During the Q&A period, we asked him about his due diligence process. When you visit a VC, no one knows your market niche, and you spend a lot of your time educating the VC about an opportunity because 99% of the time your market niche and opportunity is outside their areas of interest and expertise. McClure responded that he will try to focus on niches that he knows such as payments and finance (as he was formerly part of Paypal and was an investor in Mint.com) and he would try to crowd source among his friends the due diligence process in niches he doesn’t know. We spoke to him after the event, and suggested that we thought that this crowd source idea would still be a problem since an interesting,…..revolutionary,…..disruptive……ideas ….would not have any data that could be used to validate the market in order to make his multiple investments. McClure’s response was that he would gladly “throw $20K at a company” in order to collect some valid market data. It may take 6 months to collect that data as the engineering team builds and introduces the product/service, but he will have something that no one else has – valid market data which can be used to make additional operational pivot decisions and make additional investment decisions. His $20K investment also gives him a real world view of the abilities and innovative capabilities of a untested and unknown management/engineering team – a team that a traditional VC would never respond to since they are unknown. That is the key. A startup must be designed, from the first day, to be an entity focused on discovery and learning – as we wrote last July. Valid market generated data focused on an actual market trial – all for $20K per investor. Any startup team will have done a lot of their own due diligence work in order to identify that a large market exists in their niche. However, they will have no idea whether anyone will ever buy their product since it is completely new. The product may need buyers to change behavior, the product may be an impulse purchase, or it may actually solve a real world pain. Nevertheless, no one ever has any idea whether it will be successful because it is brand new and no market data exists. McClure will need nine other friends to investment $20K each for a total of $200K to give the team some discovery and learning runway, but given his rapidly growing contact list, that part will be reasonably easy. This will drive a traditional VC insane as it moves the largest majority of those traditional VCs further down the line toward irrelevancy. If you are an angel in an organized group hoping to make a couple of “tag-along” investments a year with other members that know something about the space, then you have become even more marginalized. McClure and his Super Angel friends will take on the additional risk that the traditional angels won’t take. There may not be any need for any VC money or additional angel money, hence, no additional dilution. If there is a need for VC money to fully validate a much larger business model, then returns on that investment made by a VC will be significantly lower than the returns made by the Super Angel investors – who got in early, collected data, discovered and learned. The Super Angels will also be learning far more about the market opportunity than any of the best Silicon Valley VCs can ever learn because they will have collected real world, market validated data about what works, and what doesn’t work. Good for Dave, and this is great news for all entrepreneurs with an interesting idea where no valid market data currently exists. Traditional VCs will need to adapt, and do so quickly. This is not a “Spray and Pray” strategy. This is a “Spray, Collect Data and Learn” strategy. As a former Wall St. analyst, it’s easy to spot really bad research reports marketed as “investment research”. The problem is that it’s not as easy for the non-investment layman to recognize bad investment research. As an entrepreneur, you know your own market niche, but what do you know of industries and market niches where you are not involved? Ten years after Eliot Spitzer demanded changes from the investment banking industry, it would appear that very little has changed. That’s an opportunity lost. Among the most odious reports were those that were produced by the analyst at the firm which was the lead underwriter of the issuer of the Initial Public Offering (IPO). We recently received a report published by a very large bulge bracket investment bank that exhibits many of the worst characteristics of bad research. Everyone likes a bullish report as it most directly impacts personal wealth through stock option programs. However, intellectual honesty requires that inflated balloons need to be identified, and discussed. We have often written up a company as a “Sell”, and we can tell you that it significantly impacted our relationships with company management and impacted our relationship with institutional accounts that owned the stock. The best book we’ve read on the perils of shorting a stock, and being right, was written by hedge fund manager David Einhorn called Fooling Some of the People All Of the Time. The lessons for a startup company from this bad research are simple. When you put together an investor presentation, don’t do what the author of the bad research report is doing: Don’t misrepresent the truth and don’t spin the truth. It looks obvious, crass, and most importantly, investors can see through the crapola. Very frequently, you will take a meeting with a VC where you are educating them about your space. Since they don’t know anything about it, they will ask other VCs who do know. When the truth comes out, your opportunity with that VC is over. Here is a small sampling of the items from the bad “research” we recently received. We will keep the name of the issuer and the lead underwriter of this “research” confidential. We don’t have a short position in the name, but we are evaluating the best time to short the stock. The best time will probably occur sometime over the next 3 months. First, an investment research report is supposed to have a section devoted to analyzing the competition, and the report will typically fit the subject into a 2-D competitive landscape. In a “Buy” recommendation report, you “expect” that the subject will be favorably reviewed in comparison to the competition. However, when the competition is not reviewed, AT ALL, one should be suspicious. When the subject is positioned at the top right of the competitive landscape chart, and positioned equally on the functionality scale against some of the largest software companies on the planet – one should be suspicious. Second, when the marketing pitch of the subject is the ONLY information presented in this “independent” “research” report – one should be very suspicious. Not only does it look bad, it looks like the work of an inexperienced amateur. When you know that the analyst is not an inexperienced amateur, but is an experienced analyst earning $1mm per year, then there is really very little room to go on the ethics spectrum. Third, when the word “disruptive” is used in reference to a software market niche that is almost 20 years old, one should be suspicious. Making the job easier and more productive is the goal of well-designed software. This is not disruptive and revolutionary. Fourth, when the marketing message of the company uses key words that are also used by its competitors; you can no longer describe the company’s technology as unique. In fact, if a competitive review had been accomplished, the analyst would probably have noticed those marketing key words were being used by the competitors. Alas, he didn’t. Fifth, as a Canadian, we’re all about hockey sticks. Unfortunately, hockey sticks and revenue or earnings profiles don’t make for a happy ending. The revenue and earnings profile of any company is typically monotonically linear; lowest in Q1, and strongest in Q4. Non-SaaS enterprise software companies follow this trend very nicely. In fact, everyone knows that the bulk of the revenues typically occur in the last two weeks of any quarter. We also know that every company tries to smooth out the transactions in a quarter by attempting to close deals earlier in the quarter. However, once a software company goes public, every customer understands that their large transaction, at the margin, could represent whether the company does really well in a quarter, just makes the quarter, or completely misses the quarter. Although this is less true for a very large company like Oracle with multiple products, multiple divisions, and multiple groups, it is true of a one product company – like the subject company. Therefore, when you see the revenue/earnings profile of a non-SaaS enterprise software company look relatively flat over Q1, Q2, and Q3, and then spike up into Q4, so that Q4 is equal to the sum of the other quarters – times 2 or 3, then one should be suspicious. In other words, when the expected revenue in Q4 is double the amount in Q3, but the earnings in Q4 is 7x the earnings in Q3, you should be suspicious. Moreover, we don’t know of ANY enterprise software company that can produce this kind of result – consistently over many years. If you see this, you should be suspicious. Seventh, we have it on good authority that the CEO of this software company was determined to get a $1billion valuation at the IPO. Software companies that take on a $1b valuation target as an end unto itself have a very, very bad history. It’s similar to a startup thinking that if you get funded you’ve achieved the goal. It almost always leads to self-destructive behavior and extremely bad executive management decision making. We can provide numerous examples in the technology world. Eighth, we have it on good authority that the average sale by the company to a client is 50% higher than reported in the research. Company management may be setting the expectations bar low, as does another well-known tech company named after a fruit. In any enterprise software company, the much larger follow-on sales occur after the initial sale. However, when the service and support organization only does “service and support”, rather than additional product sales, like any company should be doing, then it’s very difficult to generate follow-on sales at the same customer. Note to Startup: ensure that every individual team member in your service and support org is always selling. Live the letters: ABS – Always Be Selling. Compensate the sales and service team on finding new sales opportunities. Only part of the job of the salesperson is to find new opportunities. The other part is to close on those opportunities. The closing part is far more important than the finding part since the finding part should be generated by the marketing dept. (I know, we’ve hit a nerve, so let’s discuss this at a later date). Ninth, doubling your sales force does NOT mean that you will double your sales. Moreover, if you begin to add sales people in Q1, then it will take them a minimum of 6 months to ramp up and begin selling. After 12 months, the rule of thumb is that 25% of those new sales people will not be able to meet quota, so they will be gone or close to being gone – which is why you found them in the first place – they left their previous company because they saw the writing on the wall. The next 50% are a toss up – some ramping up while others are waning. The top 25% are getting the job done. In other words, doubling your sales force does NOT mean that you can double sales. Tenth, a small IPO means a small float. The float is the number of shares available for sale on any given day. The float does not include stock held by insiders, or those groups holding in excess of 5 percent. We’ll use some made up numbers as a heuristic device. If the total number of shares outstanding after the IPO is 100 million, and the company sold 10 million shares in the IPO, then most of that stock has been placed in institutional accounts. (The best customers get the “best” stock). If any institutional owner was allocated 100,000 shares in the IPO, that stock is also removed from the effective float since the reason that they got 100,000 shares was because they agreed to hold the stock for at least 30-60 days. Therefore, if the total stock traded on any day is 100,000 shares, then the stock has no liquidity because there is no float. Institutional accounts trade stock in blocks of 10,000 shares or more. In order to build a position of 100,000 shares, the institutional account trader must buy blocks of 10,000 shares over the next 10 trading days, and must try to do so without moving the market. This is really hard to do. As an analyst, valuation metrics take over – but that is another lesson. We can’t take credit for asking that provocative question which references the battle for 3Par –but it leads us to the following question: What can a startup learn from this battle of the titans? The lesson is simple: know your positioning in the value chain of your market niche, in order to understand your value. Everyone knows their competitors and knows their competitive positioning from a product feature lens. However, every market niche has a value chain of products and services that make up a solution. Do you know your position in the value chain? If your value is unique, then your value is whatever the market will bear. For example, every market analyst we have read or heard over the last week has said that 3Par is not worth $2 billion, meaning that everyone is assuming that the winning bidder for 3Par will overpay for that asset. Even 3Par doesn’t believe that it is worth $2 billion – otherwise, it wouldn’t be announcing that it is accepting Dell’s offer every time Dell bids – only to find that HP is bidding higher. Value of the acquisition/company = Revenue projection of the acquisition + Harm caused to your competitors. The last part of the equation is less precise, but if the value of harm to competitors is greater than zero, then VALUE is greater than revenue projection. Moreover, the assumption that price paid is equal to the revenue projection is wrong. Typically, an acquirer wants the revenue projection to be much greater than the price paid. We don’t know of too many companies that make an acquisition unless they believe that their bigger organization can significantly improve the sales and distribution of a target company. Hence, the success of an acquisition is not simply equal to the sum of future revenue/earnings stream. For the purposes of this blog post, let’s assume that Dave Johnson (SVP Corporate Strategy at Dell, and formerly had the same role at IBM) has had regular meetings with his engineering and enterprise sales staff, who have convinced him and the executive team that 3Par is a strategic and necessary asset. Remember that the competitive battlefield includes IBM, Cisco, and EMC (which OEMs its solutions to Dell). It’s not just HP. The solutions they sell make up the value chain within their respective market niches. Therefore, denying a competitor a piece of a comprehensive solution is very important as well. One can’t put a hotel on Boardwalk unless you also own Park Place. All week long, we’ve heard that HP has more cash than Dell, so HP was going to “win” the battle for 3Par, or at least significantly hurt Dell’s cash position. The misinformation revolving around the respective cash positions is really quite humorous. HP has $14.7 billion in cash, while Dell has $11.7 billion in cash. According to the most recently quarterly financial report, as of July 30, HP has $7.8 billion in short term notes payable, and $12.2 billion in long term debt on quarterly revenues of $30.7 billion. In other words, HP has a Net Debt position of $5.3 billion. In addition to reported cash, Dell has $0.7 billion in short term investments, $1.6B in short term debt and $3.6 billion in long term debt on quarterly revenues of $15.5 billion. In other words, Dell’s Net Debt position is actually a Net Cash position of $7.2 billion. We’re certain that Brian Gladden (Dell’s CFO) can phone five investment bankers within 60 minutes and tell them that he wants to sell $2 billion in debt by the end of the week. Does anyone believe that five investment bankers won’t respond by noon of that same day saying, “we want to lead that transaction”? Moreover, even if Dell sells $2 billion of bonds to fund the acquisition, it will still have a significantly larger net cash position vs. HP’s net debt position. Hmmm. That changes the viewpoint on the “lack of cash” story a bit, doesn’t it? So, what can a startup learn from this battle of the titans? First off, an acquirer knocking on your door may present you with a bid for your company that secures the future for you and your family. There is no need to be cute – take the bid, sell the company, think about the next company. If you are a great CEO, and your employees own equity in the company, they will follow you to the next company. Secondly, we like Dell’s bidding replies. Dell bids $18, HP bids $24, Dell bids $24.30. HP bids $27, Dell matches at $27. HP bids $30, Dell bids…..not yet known. The bidding replies by Dell actually look thoughtful and considered rather than reactionary. Hardly a brainless response. Thirdly, if you know your competitive positioning, but don’t know your value positioning, then smart and creative investment bankers will be just as irrelevant as smart and creative lawyers. 3Par has the engaged Qatalyst Group to manage the bidding process. Qatalyst is the “A” team of investment bankers, but even they don’t know the value of the deal. Qatalyst is run by legendary technology investment bankers George Boutros and Frank Quatronne. If you’ve never heard of Boutros and Quatronne, then look them up. I guarantee that you will be impressed by their influence in technology circles over the last 20 years. If you can’t hire the “A” team, and can only get a “B” team or “C” team, make sure that these teams understand your value position as well as your competitive position BEFORE you engage them. Lastly, this may not be as relevant to a startup company, but we were hoping that Dell was smart enough to have begun acquiring up to 4.9% of the 3Par’s stock, BEFORE launching its bid. Who knew that 3Par was such a hot commodity? Not anyone on Wall Street or the IT research group community. One week Dell is bidding $1.13 billion for a company valued on the NYSE for $605mm, and the next week, HP is bidding $1.5 billion for the same company. Everyone is still surprised since 3Par was barely profitable on approximately $200 mm in revenues. When a startup prepares its presentation for investors, it typically prepares a “Competition” table/chart. This identifies the major competitors, and identifies the major strengths and weaknesses of the competition. Almost invariably, the chart is defined as a magic quadrant chart with the startup located in the upper right – the best location. Everyone knows that this chart is wildly optimistic “crapola”. We don’t know of too many startups that are so “disruptive” and “revolutionary” that they can start off in the upper right quadrant. Even nuclear fusion doesn’t fit since the cost of generating power will be prohibitive for many years, and will keep its “ability to execute” rating quite low relative to its “visionary” rating. Very few startups will define a market position within a “Value Chain” chart which tries to define how a product/service fits into the existing value chain. This chart defines the strategy of the company. In other words, every company exists within a value chain of competing/complementary products, which itself sits within a community of complementary/competitor market niches. One sees competition when viewing a company through a traditional product lens on a traditional 2D competition chart. Viewing a company through a value chain lens, one can focus and identify a “crease” in that value chain in order to position and sell. Hopefully, that crease is large enough to generate $1billion or more in revenue. Therefore, the real insight occurs when a company views its product/service as part of the existing ecosystem, not simply as a product/service with features and benefits. This view allows a management team to understand that opportunities exist for their company to be acquired by complementary vendors within the ecosystem. For example, before last week, 3Par was viewed through the product/feature lens as a networking storage company that was trying to simplify storage by bringing virtualization, thin provisioning and automated storage management to the data center infrastructure. It was having moderate success as an independent company, but it had “hit the wall” at the high end. The “Cloud” has been a major theme for the last few years as it revolves around the worlds of converged and virtualized infrastructure – including storage. As a result, a standalone technology company like 3Par is really like an island in the middle of a large ecosystem trying to sell its own independent product vision. Being relevant requires the vendor to define a “story” and a roadmap of the future to the customer. In order to define and articulate that roadmap, a vendor needs to own the various pieces of that stack. In this case, both Dell and HP sell a lot of equipment to smaller organizations that value simplicity and convenience – so they purchase their equipment and services from the same organization as a bundle. By itself, 3Par is an outlier. As part of a larger organization, a vision and strategy roadmap can be articulated within a value chain – which becomes part of the “complete solution” portfolio of the enterprise salesperson. If 3Par management had focused on that value chain, we believe that it would have focused on developing partnerships that promoted its position in the value chain, rather than focusing on selling features and benefits through a product lens. Finally, kudos to Dave Johnson at Dell. Very quickly, Dell is changing and creating its own story in the storage landscape. While it is hard for any single person to be responsible for a turnaround at a company as large as Dell, we think that enterprise CIOs will now be thinking about Dell as a legitimate vendor of network infrastructure equipment and services. Why? For the first time in a long time, Dell appears to be aware of its surroundings. Dell’s next target? We’d be looking at Xsigo (funded by Kleiner Perkins, Khosla Ventures and Greylock), while others are looking to Isilon and Compellent. What Can A Startup Learn From The Departure of Mark Hurd? Last week we wrote on open letter to Michael Dell suggesting that he call Mark Hurd (ex-CEO of HP), and bring Hurd to Dell. Since we wrote that note, some additional revelations about Hurd have come to light; namely, that Mark Hurd was very strongly disliked by HP staff, and morale is not that high. 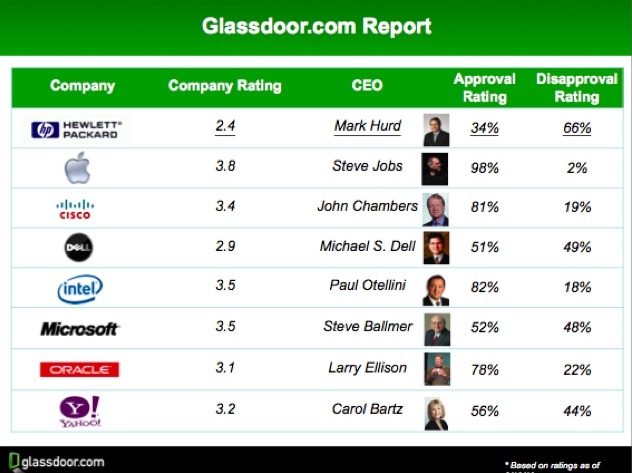 Some even called him “Hurd the Turd.” According to Glassdoor.com, Hurd’s “Disapproval” rating is 66% – 17 points higher than Michael Dell’s disapproval rating. Hurd’s “Approval” rating is 34%, while Michael Dell’s approval rating is 51%. Should this revelation disqualify Hurd from Dell? Well, the revelation is not really a surprise since we had suggested last week that part of Hurd’s “magic” was his ability to integrate acquisitions – which is code for cutting costs and significantly reducing staff.” Moreover, everyone understands that the rating on Glassdoor is driven by those who have an “axe to grind” and it’s pretty clear that Mark Hurd’s cost cutting has adversely impacted a lot of former employees of the acquired companies, who were no longer receiving stock options from a company with a rising stock price. Therefore, let’s look at a possible Hurd arrival from another angle. What exactly would Mark Hurd bring to Dell – other than replacing Michael, and getting Michael off of Cramer’s Wall of Shame? An acquisition strategy? Dell hired Dave Johnson from IBM to do that. IBM’s reputation as an acquirer was very well known and admired. Dave ran that group, so what else can Hurd add here? Not much. A cost cutting strategy? Dell has been aggressively cutting staff for several years as it attempts to play catch-up to competitors like HP and IBM. Is there anything here that Hurd can add? We don’t think so. An integration strategy? Dell was trumpeting its successful integration of EqualLogic in 2008 and Perot Systems in 2009 at the analyst meeting in June. It remains to be seen how Dell will integrate other large synergistic platforms, but there doesn’t appear to be a red flag here. Following Hurd’s integration plan of ruthlessly cutting people and costs is certainly a signpost of a successful execution path. A sales strategy? Dell is in the middle of a multi-year re-birth, and the process is ongoing. According to various sources, it is about 50% of the way accomplished – which is not good news to any potential stock holders hoping for a surprisingly positive quarter. Moreover, the sales team is the one group that is most harshly scrutinized, as it’s the easiest to measure performance. If you don’t make your sales numbers over 2 or 3 consecutive quarters at a startup, many CEOs (and their VC financiers) will “recommend” that you find a new employer. One local CEO tried to find the right sales people – 25 times – over a period of five years. Ten of these sales people left on their own as they didn’t appreciate the frequent changes in their responsibilities and remuneration, and the rest were terminated for lack of performance. The search for the “right” sales team at this “startup” continues. A consumer strategy? This area was “MIA” at the analyst meeting last June, but we doubt that Hurd would accept a lesser role at a peer company other than Oracle. Therefore, what would Mark Hurd bring to Dell that is significantly better than what Michael Dell has done since he returned to the helm? Frankly speaking, we don’t know. Therefore, Michael Dell should call Mark Hurd to wish him “well”, but at this point, we are going to admit that we were wrong in suggesting that Michael Dell should call Mark Hurd in order to bring him to Dell. We think that Dell can do much better, Dell deserves much better, and if Michael decides to step aside once again, Dell needs someone much better than Mark Hurd. Lastly, what can a startup learn from the departure of Mark Hurd? Jim Barksdale (the former CEO of Netscape) was quoted that he wanted Netscape to be a “good” place to work, but not necessarily a “nice” place to work. Barksdale wanted his organization to have the sense that the next day could be the last day, so exceed your own expectations at whatever you do – as the survival of the company as well as your own survival, depend on it. A startup needs performance from everyone in order to survive. The departure of Hurd has revealed that HP was a good place to work but not necessarily a nice place to work.